Majority of the users agree that the shoe’s soft woven upper doesn’t need any break-in time. Like the Hyperdunk X, the Nike Kyrie Flytraps are ready for the game straight out of the box. Many wearers appreciate the shoe’s asymmetrical tongue as it makes it easier to put the shoe on. Like the Kyrie 5, some wearers comment that the tongue improves the fit, making it feel like a glove. The tongue stays put during play due to its construction, one tester notes. There are mixed reviews for the traction; however, most of the users say that the Flytrap has a solid performing outsole and will work especially well on maintained indoor courts. One tester states that it is at par with the Kyrie 4's traction. Most commenters feel that these Kyrie shoes are actually quite comfortable. A couple of testers share that the rubber compound on the outsole barely picks up dust; when it does, light wipes are all that's needed. Aesthetics-wise, many reviewers love the textured Nike logo and the cool colorways that the shoe comes in. Several users like how the thin upper material and the Phylon midsole provide lightweight containment and cushioning. That the shoe has a dead space in the forefoot area is a common complaint by many testers. One reviewer notices that the Kyrie Flytrap does not grip unmaintained surfaces that well. He added that courts that aren't refinished every so often yielded the worse results. Although the Phylon in the midsole is plusher than the material in the Kyrie 1 to 3, it still does not provide enough impact protection according to some wearers. One reviewer says that he experienced some back pain after playing in the shoe for a few hours. A couple of expert reviewers can’t feel the Zoom Air unit in the forefoot as it is quite small and only covers the ball of the big toe. Although the materials on the shoe look premium, several purchasers note that the materials actually feel cheap on hand. Majority of the users recommend the Nike Kyrie Flytrap. It is a solid performer that comes at a really affordable price. A few expert reviewers feel like there’s an issue with the traction on specific courts. However, majority share that it actually works great for them and they have no complaints. For a $80 budget model, I was actually fairly impressed. I definitely recommend the Kyrie 4s more so than the Kyrie Flytraps. The Kyrie Flytrap is priced at budget-friendly $80. It is the first shoe under Irving's budget line. The shoe's techs mirror those of the Kyrie 4. It is equipped with a knitted and breathable mesh, curved midsole for stability, and a Zoom Air cushioning in the forefoot. The name Flytrap is a nod to Irving's place of birth Australia. The term is a direct reference to the Venus Flytrap, a carnivorous plant that is a fairly common in the land down under. Cushion. The injected Phylon midsole houses a small Zoom Air unit underneath the ball of the foot. This setup provides flexible full-length cushioning and a responsive low-profile forefoot. The midsole is decoupled, making it more responsive to the feet's natural movements. The decoupling specifically allows for smooth transitions while as the wearer weaves through their opponents. Traction. Very similar to the Kyrie 4, the Kyrie Flytrap features a modified herringbone pattern. A major difference is the Kyrie Flytrap’s use of more flat areas. The traction pattern extends to the side walls of the curved midsole, allowing athletes to stop on a dime when making quick cuts and steep crossovers. Made of durable solid rubber, the shoe's traction performs best on maintained courts; though it performs on outdoor courts as well. Dusty courts are not a problem as the rubber compound used on the outsole does not attract much dirt, and a light wipe is enough to clean it. Length and Width. The Kyrie Flytrap runs a tad bit wide in the forefoot area. If you are a wide-footer, go with your standard Nike basketball shoe size. Narrow-footers may find it effective to just tie the laces tighter or wear extra socks. Reviewers do not recommend going a size lower because the toe box could jam into the user’s toes. Lockdown. An asymmetrical burrito-type tongue is incorporated in this team basketball shoe’s design. This allows for a customizable fit and easy entry. Once laced up, the shoe provides increased comfort due to the cushioned tongue and collar. A thick elastic strap that runs over the midfoot is integrated into the shoe's lacing system; adding extra tightness to the upper. The soft, thin upper is made of woven textile. It is screen-printed in different areas. The resulting pattern not only adds a visual pop but also enhances the durability to the shoe, making it more resistant to abrasion and tearing. A gore-strap and an internal heel cup are integrated into the upper's design, effectively improving the shoe's lockdown. In the mid part of the Flytrap's Phylon midsole, a small torsional shank is embedded. A Zoom Air unit is also installed at the forefoot. The outsole uses a solid rubber compound that is durable enough to withstand outdoor courts. 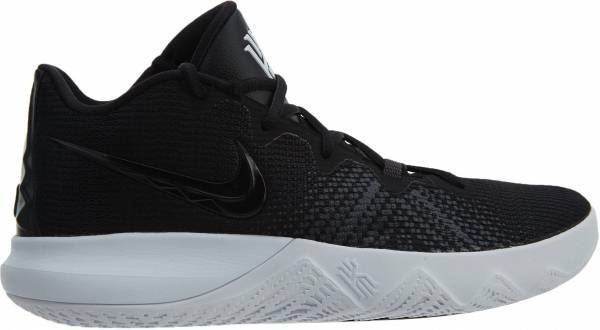 The Nike Kyrie Flytrap looks very similar to the Nike Kyrie 4, though much of the Kyrie 4’s accents such as the jagged teeth on the sidewalls of the midsole are toned down in the Flytrap. The leather material used on the tongue adds to the shoe's off-court wearability while its knitted texture gives the shoe personality. The zigzag accents in the Achilles area and on the Nike logo symbolize the teeth of the Venus Flytrap. The Nike Kyrie Flytrap is initially released in three colorways. The first one is the Black/White-Volt colorway. Next is the colorway that is inspired by Toy Story, one of Irving’s favorite movies. The left shoe is Buzz Lightyear themed while the right shoe features Woody. The third colorway is a collaboration between Nike and a footwear and apparel store called Bodega.